Wire crimping services from SHINE support reliable electrical connections. Wire crimping services from SHINE harness the power of a ISO 9001:2015-certified manufacturer of custom cable assemblies, wire harnesses, and electro-mechanical assemblies. 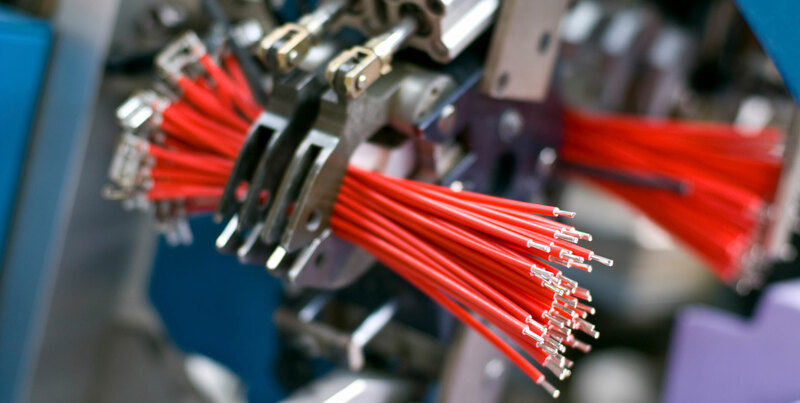 SHINE provides high-quality wire crimps as part of our electronic manufacturing services. Wire crimping is a fast, reliable, and rugged termination method that connects a wire to a terminal without soldering. The crimped section of the wire is deformed and the insulation is compressed without piercing. With good crimps, wire strands protrude through the front of the conductor crimp section by at least the diameter of the wire’s conductor. As an experienced provider of wire and cable processing services, SHINE adheres to crimp quality standards such as IPC/WHMA-A-620. We also perform crimp force monitor testing. Wire crimping services from SHINE are an important part of our lead wire assembly and custom cable assembly services. Wire crimps can be either open barrel crimps or closed barrel crimps depending on terminal type. SHINE can wire crimp open barrels and closed barrels, and also provides single-end crimps and double-end crimps. We work with insulated terminals and non-insulated terminals, and support wire sizes from 2 AWG to 32 AWG. SHINE uses crimp termination equipment from suppliers such as TE, Panduit, Molex, JST, Hirose, and Connex (to name a few) for crimp termination. Our tooling and equipment includes over 100 hand tools for crimping, pneumatic bench presses, and electric and pneumatic presses. Unlike hand tools or benchtop equipment, fully-automated crimping equipment incorporates wire cutting and wire stripping. First, automated crimp centers process the wire from its source in a reel or barrel. Next, the wire is cut and stripped. Finally, the terminal is crimped. Automated crimp processing equipment supports higher volumes than either hand tools or benchtop crimping. SHINE’s use of the fully-automatic Schaefer Megomat UNO Lead Maker also provides greater consistency than either manual or semi-automatic operations. SHINE makes custom cable assemblies, wire harnesses, and electro-mechanical assemblies. Since 1984, we’ve been providing partners with wire and cable products that exceed their expectations. How can we help you? Contact us at our manufacturing facility in Adams, Massachusetts for more information.